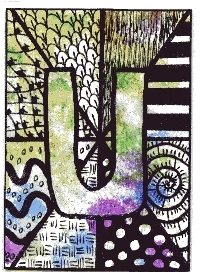 Zentangled Alphabet - "U". Zentangle an upper case U. On ATC sized, 2.5 inch x3.5 inch card stock or similar sturdy paper. You will have 1 swap partner for one Zentangled U ATC. Adding a color or using a colored paper or color washed background is optional. Karmi53 you should be able to sign up. Newbies are welcome.